On January 30th and 31st, Totnes Community Development Society opened the doors of the Atmos Totnes Hub again for 2 days of consultation. Over that time, 250 people passed through and shared their thoughts on the next steps towards a site design for the former Dairy Crest site. The consultation had been preceded, over the two previous weekends, by the work of what was called the ‘Community Design Team’. 20 people from across the community came together for an intensive 4 days of design work, which included site walks and tours of Totnes to study the architecture there. Display introducing the Community Design Team. 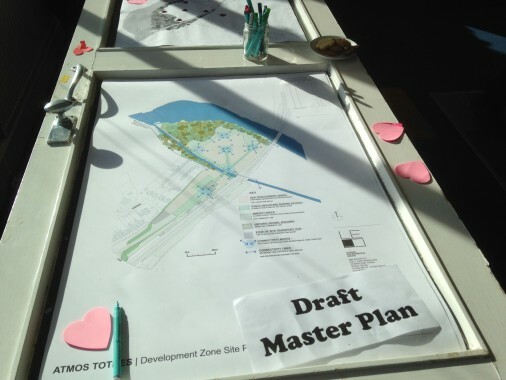 The consultation at the end of January told that story, presenting the outputs from the workshops, as well as identifying the key principles coming through strongly in relation to housing, open space and so on, and asking for the community’s feedback. 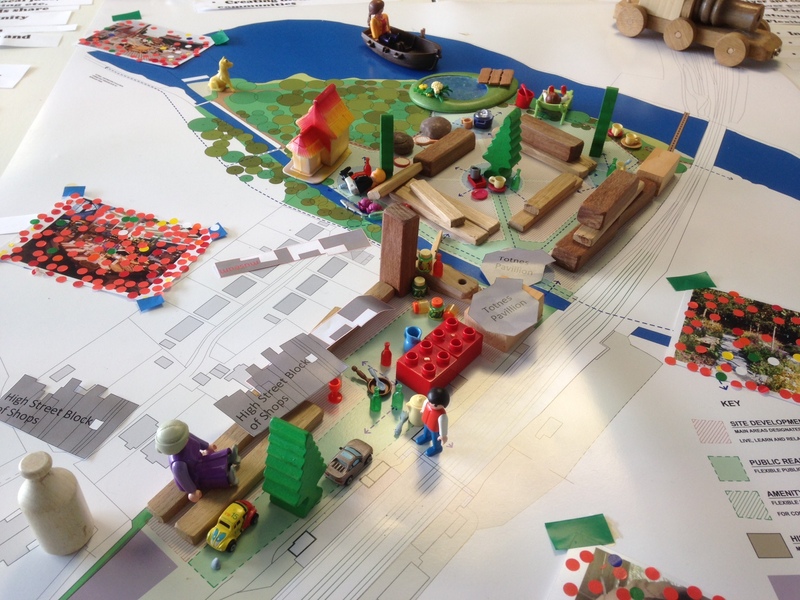 An initial draft masterplan was presented, as well as an innovative 3D model formed using childrens’ toys and scaled cut-outs of recognisable Totnes landmarks, which gave a sense of uses and scale. The Hub was buzzing, and many of those visiting left their thoughts and suggestions. We’d like to thank everyone who came and Encounters Arts for their highly skilled facilitation. There will soon be more opportunities to engage with this process and to share your thoughts on the ongoing design process. Keep an eye on this website, subscribe to our mailing list, or just keep an eye on the local press or for our eye-catching banners around town.